SOIL SOFT™ was designed to soften soils for better water penetration and improve water drainage on hard, compacted soils. It contains enzyme complexes and powerful surfactants that allow the water to move through the soil more readily. 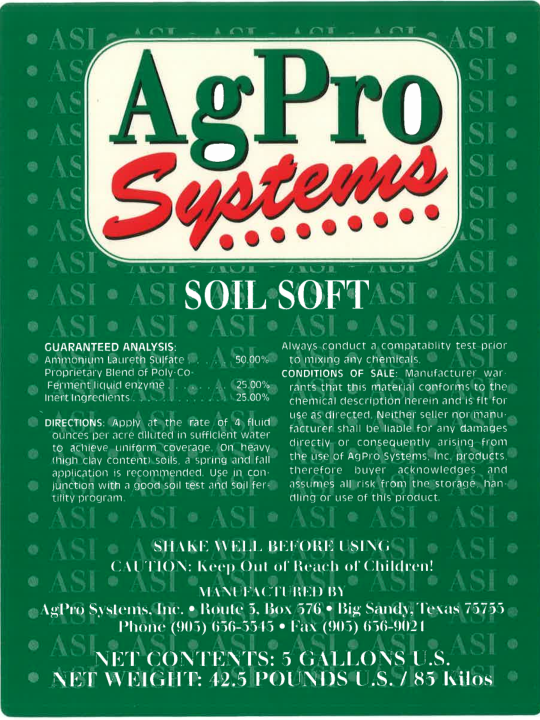 AgPro™ SOIL SOFT™ is a blend of powerful surfactants developed to soften hard compacted soils. These surfactants also contain enzyme complexes that aid the rapid warming of the soil by releasing nutrients and making them more available to the plant. Apply at the rate of 4 fluid ounces per acre diluted in sufficient water for uniform coverage. On heavy (high clay content) soils, a spring and fall application is recommended. Add SOIL SOFT and mix 1-2 minutes with lower than normal agitation.